$150 starting prices for Houston auto headliner repair? Yes. This is the lowest price you will find anywhere. We guarantee it. You can spend the whole day shopping around or you can just call us right now and we will work on your car’s headliner today. No appointment needed. We are cheap Houston auto headliner repair leader. Call us at 281-661-8180 and see what we can do for your car, truck, SUV, van or motor home today. After repairing nearly 10000 vehicles with headliner falling at Ramy’s Garage It’s not the glue that releases but the backing on the headliner material that deteriorates and then the headliner material and backing start to separate. This crumbling of the foam rubber portion of the headliner material is what creates the sagging. When this happens people will try all kinds of things to fix it, from injecting glue through the fabric with a syringe, stapling the fabric up, thumbtacks, whatever it takes to make the thing stay up. The problem is that this will keep getting worse as more and more of the headliner deteriorates, it will become a safety issue and it looks bad. 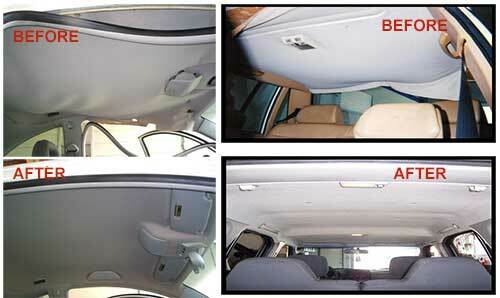 Having your headliner material replaced is an important safety concern. With many of the new cars having airbags installed just above the headliner, The upholsterers headliner technician at Ramy’s Garage must deal with the newer vehicles just a little differently. we make sure the ignition is in the off position for the duration of our work being done. The airbags must be disengaged in order to remove the headliner material and board. If the airbags are disengaged and the ignition is turned on, the air bag warning light will come on and will have to be reset by the dealership. You don’t want to have to go through all of this hassle, so just make sure the ignition stays in the off position.